Starting 24 March is the latest Red Rag show. 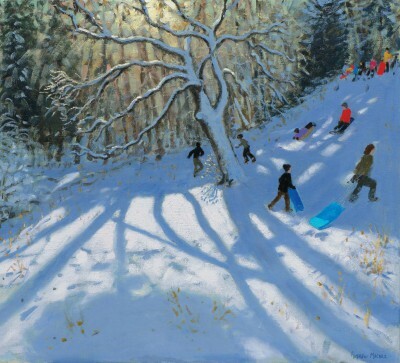 It is a solo show of stunning new paintings, by renowned British artist Andrew Macara. Macara has an extensive and varied body of art work created over more than four decades. He has a unique capacity ' whatever the subject ' to capture the essence of a scene with apparent ease, excluding extraneous detail. The Royal Society of British Artists (RBA) 301st exhibition commences 21 March. The show takes place at The Mall Galleries, London. The exhibition is sourced from member artists. On show is an eclectic mix of style and media. The RBA promotes painting, sculpture, printmaking and drawing. The show starts on 3 March and continues until the 25 March. The gallery is open from 10:00 each day including Sundays. British artist Howard Hodgkin has died. His colourful works were often inspired by the landscapes of India. Hodgkin studied at Camberwell School of Art and Bath Academy of Art. He won the Turner Prize in 1985 and was knighted by The Queen in 1992. His work has been shown around the world. Major retrospectives have taken place at New York's Metropolitan Museum of Art and Tate Britain. Red Rag's interest in works by Scottish artists has expanded. 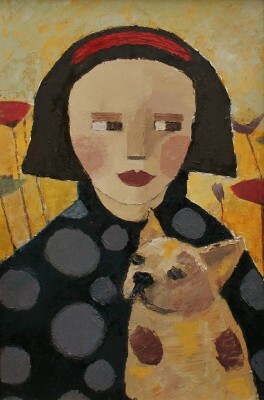 Nikki Monaghan's paintings are now available from the gallery. Monaghan has a quirky take on landscapes, seascapes and figures. Nikki's work is rich in colour and pattern. Some of the biggest names in British art are helping to raise funds for GSA. They include: Grayson Perry to Anish Kapoor and Antony Gormley. Artists have created artworks from ashes of the fire gutted Mackintosh building. The art works will be auctioned by Christie’s in March. The aim is to raise £13.5m to rebuild the Mackintosh-designed building. Featuring fine oil paintings by Helen Turner. Her landscape paintings are rich in subject matter and tone. She is a master at capturing the atmosphere of moments of time. Quirky new oils from Catriona Millar now at Red Rag Bath. Scottish artist Catriona creates captivating oils of people, animals and birds. Her fascination with faces is evident. And, many art collectors have been drawn to the work. As a result her paintings are in collections across the globe. His white Wood paintings are in the tradition of British surrealism. In a wintery forest men wearing large overcoats and bowler hats stand in woods. Jane produces fine still life pieces. She is fascinated by the everyday objects particularly of times past. Antique books and pots are common themes in her oil paintings. Her work has the appeal of the old masters but are in a contemporary style. Primarily Bronzes with earthy rich patinas, his work is in collections all over the world. He is also a past winner of the David Shepherd Wildlife Artist of the Year. Influential British artist David Hockney is to design a window for Westminster Abbey. Located in the north transept of the gothic Abbey. The cost is being funded by two anonymous benefactors. Red Rag artist Rosa Sepple has been elected Vice President of RI. Rosa becomes the first woman to take-up the post. Bank of England Governor Mark Carney announced today Friday 22 April that the artist Joseph Mallord William Turner is to appear on the new £20 note. The new note will feature a self-portrait of Turner and also his 1838 oil painting The Fighting Temeraire tugged to her last berth to be broken up. Talking about the new Bank note Bank of England Governor said “Turner is perhaps the single most influential British artist of all time. Latest show at the Royal Academy examines the role gardens played in the evolution of art from the early 1860s through to the 1920s. Using the paintings of Monet as a starting point the exhibition traces the emergence of the modern garden. The show explores a period of great social change and innovation in the arts. The show runs until 20 April. It features important Impressionist, Post-Impressionist and Avant-Garde artists of the early twentieth century. Here is a little taster of what is in store for you. 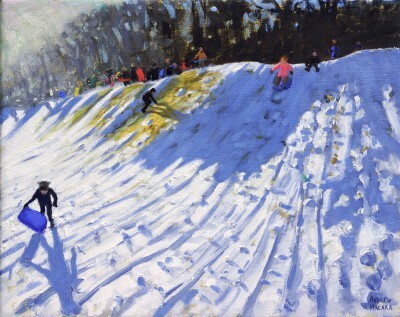 Andrew Macara's winter scenes are always highly sought after. So we are pleased to include both his small and large paintings in the show. 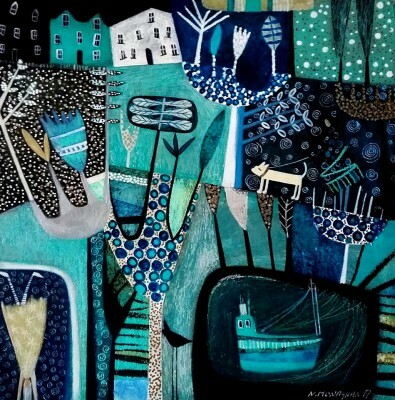 Also from Wales is artist Vivienne Luxton. Another firm favourite at the gallery is Mark Preston. Come and join the Winter fun! The 'Winter Show' continues until the end of January. Taking place right now at Red Rag Gallery in Stow is the annual 'Scottish Show'. Works from over 30 Scottish artists are in the mixed exhibition. This is a solo show by leading Cornish artist Amanda Hoskin. Starting today at Red Rag in Stow is a solo show from Mark Preston. Mark is known for his exceptional paintings of British Landscapes. The shortlist for this year's BP Portrait Award have been announced. In addition to a Spanish painter and Israel artist is Michael Gaskell. Gaskell is a British artist and past runner-up in the award. Nearly 2750 portraits were submitted from 92 different countries. The winner of the £30,000 prize will be announced in June. Red Rag have just released new prints from Scottish artist Deborah Phillips. 'Clifftop Allium, Crail' and 'Hot Fiery Sunset' are the latest titles. There are now 14 limited edition prints in the series. All titles are available for immediate purchase. This weekend Red Rag in Stow is hosting a three person show. The Royal Society of Portrait Painters annual exhibition starts 16 April. Art works are by members and non-member artists. The show is at the Mall Galleries, London. Art works by the Scottish artist Jack Vettriano has raised more than £800K at Bonham's auction in Edinburgh. The highest price achieved was for 'Waltzers', which sold for £236,500. A total of seven paintings sold. Five paintings failed to reach their reserve prices. The collection was offered for sale by an anonymous collector. 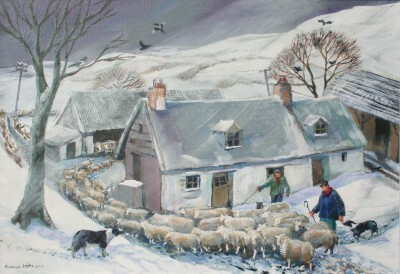 Starting Saturday 28 March Red Rag in Stow features Welsh artist Martin Llewellyn. Llewellyn paints the mountain range of Snowdonia and dramatic coastline of Wales. 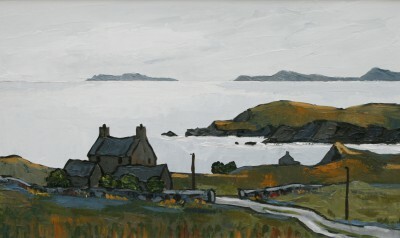 Like many Welsh painters of his generation the influence of Kyffin Williams is evident. 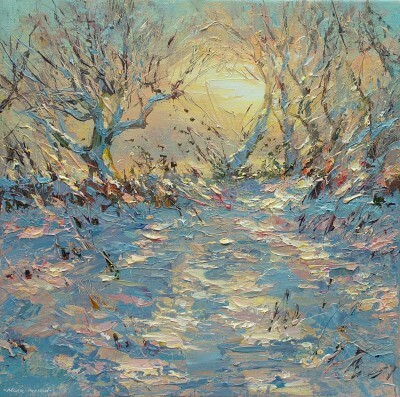 Martin's oils are highly textured with his use of palette knife technique. The latest exhibition at Red Rag Gallery in Stow features Still Life works. Welsh artist John Knapp-Fisher has died at the age of 83.He was known for his paintings of landscape and seascapes which were inspired by south west Wales. Born in 1931 he moved to Wales in the 1960's. Knapp Fisher was the son of an architect and he studied art and graphic design at college. In 1992 he was elected a member of the Royal Cambrian Academy of Art and much of his work was inspired by scenery near his studio in Croesgoch and the harbour at Porthgain.